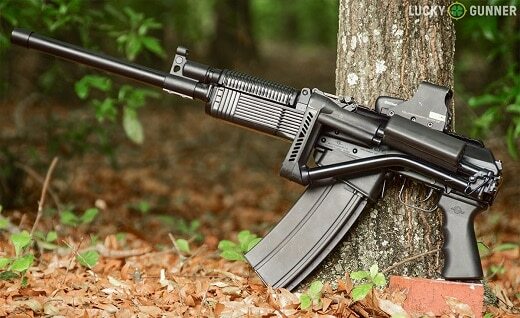 AR 15’s may be the most common gun from America, but the AK-47 will forever be the favorite gun from Russia. Love it or hate it, these guns are now manufactured domestically making them almost as American as the M-16. These rifles have reputation for being crude, inaccurate and primitive weapons. Nothing could be further from the truth. While many people compare AR 15’s to scalpels and AK-47s to hatchets, AK-47s can be used just as surgically and precisely as an AR 15. AK-47s can benefit tremendously from the use of a scope or red dot optic. They were designed well before every person felt they needed an optic and this is reflected in the firearms function. Mounting a scope to an AK-47 is tricky and easy to get wrong. Here are the best scopes for AK-47 on the market, as well as a few tips and tricks to making sure that you get it mounted up properly. How to Choose a Rifle Scope for an AK-47? Choosing a riflescope for an AK-47 boils down to personal preference along with a technical understanding of how these optics will perform in the field. Not only do optics get expensive quickly, small differences in quality and specification can amount to huge differences in the field. As a general overview, here are a few of the categories that you should consider well before you go shopping for an AK-47. When it comes down to choosing the best optic for an AK-47, smaller and lighter is always better. Because AK-47s are not used to shoot at long distances, large objective lenses will nearly always be a hindrance. The cartridges used in AK-47s just don’t have the punch to make it out much further than 300 yards, and only low magnification is needed to shoot at a very precise level at 300 yards. The vast majority of AK-47s will never be shot past 100 yards in their entire lifetime, making these rifles prime candidates for red dot optics, especially miniature red dot optics. The AK-47 is a rifle that doesn’t recoil very hard so adding weight and bulk to the rifle only makes it more difficult to use and doesn’t improve the handling in any meaningful way. Stick with as slim and trim an optic as you can get away with for the task you have at hand. You’ll appreciate it after an hour or two at the range, or on opening day of deer season. Budget is a dirty word nobody wants to talk about. Typically, people buy AK-47s to take advantage of cheap ammo or to get a cheap semi-automatic tactical rifle. This is completely fine, but it makes little sense to spend an equal amount of money on your scope as you did on your rifle. At that rate, you could just have bought a nicer rifle! The good news is that with the litany of products available on the market today, you can find very good scopes for not a lot of money. But that scope is going to be a red dot or magnified optic, you can rest easy knowing that virtually every major manufacturer is producing a scope that is going to go great on an AK-47. Almost all of them are producing scopes for cheap as well. AK-47s are typically hard use rifles. These guns are constantly getting tossed into and out of your truck, dragged out to teach new shooters marksmanship, and used whenever cheap steel cased plinking ammo has been bought. AK-47s are lauded is one of the most reliable and rugged rifles ever produced, so you need a scope to match. Whether that scope is going to be a red dot or magnified optic, you need to be absolutely sure that when you go to the range or keep your gun next to your bedside, the optic mounted on it is going to do the job no matter what. Also make sure if you buy a scope betting on its warranty, you bought from a company that has the customer service to back up its guarantees. You don’t want to buy from a cheap import company and be left alone when your scope breaks. The type of scope that you use on your AK-47 is going to be determined by the function you intend your rifle to perform. It’s simply not as easy as walking into a sporting goods store and choosing a scope based on whether or not it has a 7.62x39 bdc reticle or whether or not it can be used as a hunting scope. If you’re going to be shooting beyond 150 yards, consider a red dot. Not only are they cheaper than they used to be, they are lighter, more rugged and are often better suited to the task of being use on an AK-47 than a magnified optic. Past 150 yards, you can greatly benefit from light magnification but virtually all AK-47s are not going to be used in a situation where heavy magnification is going to be necessary. Trijicon is the undisputed leader of military grade optics. No other company supplies as many magnified optics to the United States military and NATO forces than Trijicon. Their leading product and customer favorite is the advanced combat optical gunsight, ACOG for short. They offer a ton of different models within this line-up, the 4x32mm dual illumination being the best ACOG for an AK-47. This is a no holds barred, bombproof optic. Designed to work on both battery power and sunlight to make sure that the BDC reticle always has illumination. The fixed 4x magnification means there are no knobs or switches to dial in under stress. The entire optic is built around a single piece of aircraft grade magnesium housings, along with the built-in mount. While finding the correct mounting option for an AK-47 will be difficult with this gunsight, no other sight offers the same rugged reliability and simplicity that this optic does. If you can find a mounting option, put up with the slightly higher weight and increased cost of one of these optics, you’ll be served with performance in spades. Primary Arms might not be a leader in optics manufacturing within the United States, but they are a leader in cost-effective optics worldwide. Many of their designs feature innovative technologies and methods of doing things that set them apart from traditional optics. Combined with the fact that they often come in at half the cost of American manufactured optics and you have a winning combination, especially for hard use rifles like an AK-47. The great thing about this rifle scope is that it combines 3x power magnification with a BDC reticle that takes advantage of the full range of the 7.62x39 intermediate cartridge. Mounting this rifle scope requires care because the dust cover of an AK-47 must be removed for cleaning and you wouldn’t want to obstruct that with your scope mount. Once that is sorted out you can reliably hit targets out to several hundred yards with this scope on your AK-47. If you plan on thrashing on your rifle particularly hard, you’re going to want to Vortex Optics. Not only does Vortex Optics manufacturer some of the most rugged sporting grade optics on the planet, they are backed up by one of the best warranties and customer service departments in the business. This rifle scope, in particular, lends itself well to an AK-47 because it combines medium power magnification with a low-profile objective bell and scout set up. This means that the scope can be mounted on the fore end of your rifle without making it excessively heavy or bulky, and not interfere with the workings or disassembly of an AK-47. This is huge. This means that you can add a second focal plane riflescope designed to stretch your AK-47 easily out to 500 yards with practice. You don’t have to worry about durability because this scope is manufactured by Vortex, and you don’t have to worry about missing shots because you have a maximum of 7x magnification and a 32mm objective lens to shoot out to the very edge of your range. Primary Arms, while a newcomer in the American optics scene, has a ton of different interesting products. This one, in particular, is a light and fast 1-4x magnification scope featuring a 24 mm objective lens and illuminated reticle. Most of the time, AK-47s are not the candidates for precision optics, at least for standard scopes like this one. Finding the correct mounting solution can be expensive. With the price of this optic, however, you can easily afford a high-quality scope and mounting solution. While this is a pretty standard low magnification scope design for a carbine, it does offer a lower price point than many others in the market. Making it perfect for a hard use gun like an AK-47 that is going to see a lot of rounds in its lifetime. While it is certainly difficult to mount a precision optic on to an AK-47, it’s certainly not impossible. In fact, Bushnell has manufactured this precision style rifle scope to serve the AK-47 specifically. The AK-47 is not known as a long-distance rifle, but taking advantage of this scope’s 1-4x magnification means that you can range out to the very edge of the 7.62x39’s ballistic potential. The 24mm objective bell houses a fully multicoated lens system and illuminated BDC reticle specifically designed to predict the shots out of a standard AK-47. This scope fits the bill of having a generous eye box and fast focus eyepiece but mounting options will need to be carefully considered for this scope. It utilizes standard eye relief which can be a problem with AK-47s. Otherwise it is one of the best on the market for long-range shooting with an AK-47. This is one of the best and most cost-effective professional grade red dots on the market. Its unique size and capability makes it excellent for all lightweight intermediate carbine rifles. The AK-47, in particular, can utilize a large diameter red dot sight like this one because it works well with forward scout mounting options. It is a particularly rugged sight perfect for rifles that are going to be used hard in the field, AK-47s are notoriously abused, and with the reputable warranty that aim point is known for you shouldn’t have any problems. Other than the reliability and features that this red dot packs, the 50,000 hour battery life is its main selling point. This red dot can be turned on and run for longer than a year on high. Changing batteries can be an annual affair, rather than having to worry about whether or not your rifle will have a sight when you pick it up. Few other red dots on the market can measure up to this value minded option from aim point. Making it one of the best red dot sights for an AK-47, an excellent scope in general. Miniature red dots are particularly useful on AK-47s, because they cut down on the overall weight and bulk of the rifle. Many of the miniature red dots that have been sold in years past have been expensive, coming from high-end manufacturers and military suppliers. Sig Sauer, the acclaimed pistol manufacturer, recently entered into the optics manufacturing business and they hit one out of the park with their Romeo5 Compact Red Dot Sight. It has the same footprint as many of the other red dots on the market, sized perfectly for a rifle like an AK-47 that will be used within 100 yards. The thing that sets this miniature red dot apart from all others is the price and features. This sight is coming in at less than a third of other red dot sights along with proprietary features like its motion sensing operation. The sight forgoes expensive battery conservation methods by only turning on when the rifle is moved. After a period of time, the site turns off to conserve battery life. This keeps the mechanisms and electronics inside the sight cheap and rugged. Oftentimes you can find the sight included with a mount for very reasonable prices, making it one of the best companions for one of the Century or Arsenal AK-47s aimed at budget minded shooters. In the past, many people have attempted to add magnification to red dot optics by adding a magnifier. Vortex Optics, being one of the most innovative optics manufacturers in the market, has produced a 3X power magnification red dot sight at a price the most anybody can afford. Vortex Optics is known for being rugged and reliable but also producing extraordinarily cost-effective products. The Spitfire Prism Scope, in particular, is a great option because it incorporates a mount along with the sight. This makes it easy to attach to any of the mounts that are common to AK-47s. While you do give up the parallax free nature of a traditional red dot sight, you don’t give up any of the features regarding brightness or night vision capability. Everything that you are used to with a larger aim point or ACOG is present on this sight, it just adds in 3x magnification. Perfect for anyone looking to shoot that sweet spot of 100 to 300 yards that the AK-47 was made for. 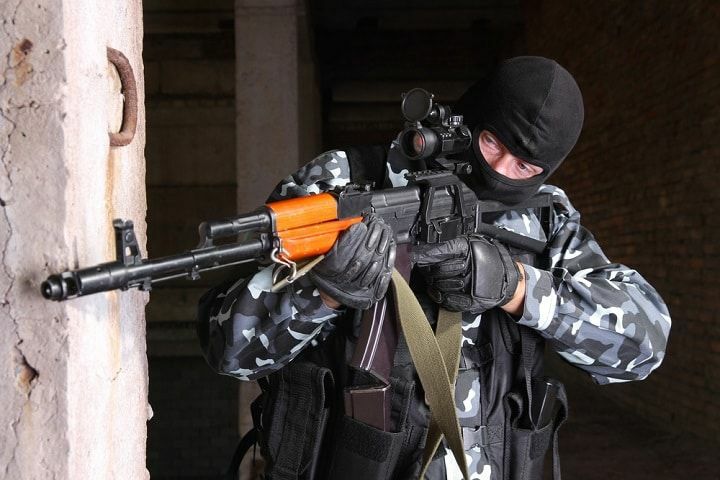 The majority of traditional rifle scopes that you put on an AK-47s are typically side mounted. Meaning, they are utilizing a scope base that is been drilled into the side of the receiver, that is secured in a way that still allows the dust cover to be removed for cleaning without affecting the zero of the rifle scope. The only trade-offs to this method of mounting a scope is the increased weight and bulk, and the increased height above the bore axis that you get from having to clear the dust cover. 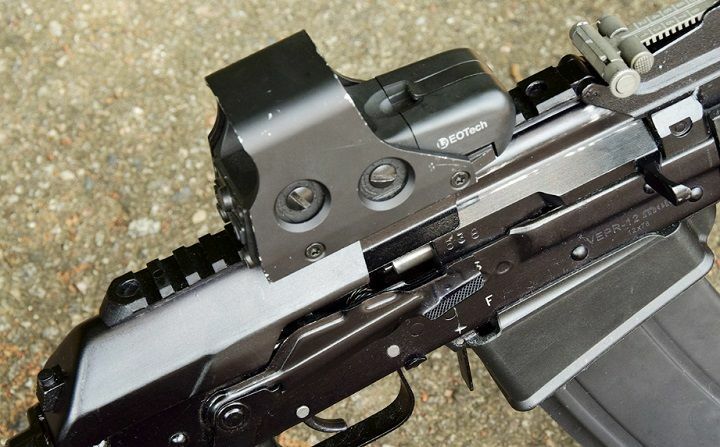 This is the most balanced and arguably the most effective way to mount an optic to an AK-47. In fact, this is the way that virtually all Russian AK-47s utilize optics. To make the most out of this method of mounting, try to keep as low-profile a mount as possible that minimizes the distance between the bottom of the rail and the dust cover. Also, try to get this mount professionally installed because it’s very easy to interfere with the internals of the gun if you drill too far. 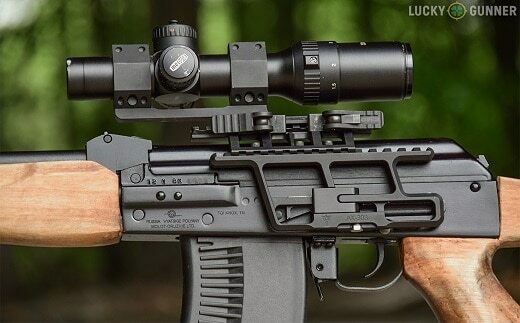 While not as common anymore, many people have taken to mounting picatinny rails to the dust cover of their AK to get a low-profile scope mounted. While this seems like an obvious place to put a scope, it comes with several problems that have to be dealt with. Namely, you have to remove the dust cover to clean the weapon. That means that each and every time you clean your weapon you are going to be removing the zero from your gun. Because the dust cover is a moving part, there’s no way to know any given time how accurate your zero is on your rifle. If you have a rifle that is exclusively used for plinking at the range and will not be used for long-distance shooting or hunting of any kind this isn’t a problem. However, as soon as the accuracy of the rifle becomes critical it’s useless. Several attempts at making hinged dust covers or tighter tolerances have tried to remedy this situation, but you are much better off using a side mounted optic or a scout mounted optic in the long run. It’s very common for people to buy aftermarket handrails or gas tubes that feature picatinny rails in order to mount an optic scout style on an AK-47. This is by far the most common method used for adding optics to an AK. Not only is this the most minimally invasive way for you to fit a scope to your rifle, it retains your iron sights and allows you to clean your rifle without having to re-zero your optic each and every time. The downside to this is that you have to use an optic compatible with being used in a scout configuration. This is fine if you are okay with a red dot or other compact CQB style scope but can be a problem if you plan to use your rifle out past 200 yards. To make the scope set up work properly you have to select equipment specifically tailored for scout style shooting and give it time to get past the steep learning curve that scout optics have. If you can do that, the scout set up as among the best for AK shooters. It has become popular in recent years, with the advent of miniature red dot sights, to replace the rear sight of an AK-47 in order to provide a platform for a red dot. This is generally a bad idea because it eliminates the iron sights on your AK-47 and leaves you with no backup if you’re red dot becomes damaged or runs out of batteries. The other problem is that the mounting for these major red dots is normally calibrated for the height of an AK-47. This is problematic if you remove the rear sight and mount your sight there, because the red dot will be too high to get accurate shots with a traditional cheek weld. You’ll then need to modify the stock to raise the comb or deal with a sub optimal shooting position. All this modification and adaptation is not ideal for fast follow-up shots and if you can shoot quickly, why do you have an AK? You’re better off just sticking to one of the more traditional mounting systems used on AK-47s and retain your iron sights just in case. Sometimes mounting an optic on an AK-47 requires substantial modification. Make sure that as you swap parts on and off your gun that you are maintaining all of your state and federal compliances. AK-47s, in particular, run into trouble with these because the vast majority of AK-47s on the market are imported from other countries. If you have a domestically produced AK-47 there’s very little to worry about, but if you start exchanging parts off of your AK-47 and don’t check to make sure that you have the correct number of parts being produced within the United States, you may run into trouble with import regulations. We’re not lawyers, and this is a very obscure portion of the law that you should consider when you start modifying a gun like an AK-47, especially depending on the state that you live in. Setting out to put a scope on an AK-47 these days is not only commonplace, people who don’t are the exception. The available options for AK-47 optics run from tiny micro-red dots that utilize next generation technology, all the way to traditional scout scopes that have become favorites for AK-47 shooters. No matter what sort of optic you decide to settle on, make sure that you get your hands on some of the cheap ammo that is common for AK-47s and enjoy shooting your rifle. The best optics for AK 47 in the world doesn’t do you any good if it’s at home on your shelf.